George Henry Jenkins - Salcombe harbour over Black Stone Rock, Devon - Online gallery supplying original fine art. Trending Modern British and Contemporary Welsh. Available for sale from Big Sky Fine Art; this original oil painting by George Henry Jenkins, dating from around 1890.<br> The painting is presented and supplied in a late 20th century complimentary frame. <br> <br> George Henry Jenkins was a West Country artist who painted extensively throughout Devon and Cornwall in both oil and watercolour.<br> <br> His subjects are landscapes and seascapes. He lived at 10 Saltram Terrace, Plympton, Plymouth from 1873 to 1880. He and his wife Hannah had seven children. His second child was named after him and also became an artist.<br> <br> He exhibited locally at the Society of Western Artists, Plymouth Arts Club and at the RWA in Bristol. He showed a total of 20 works at the RWA between 1892 and 1895 at the Annual Winter Exhibitions, subjects included On the Lledr, North Wales and in 1892 King Arthur's Castle, Tintagel. He did not appear to exhibit in London but did show Trawlers entering Plymouth Sound at the Dore Gallery in an exhibition of West country artists c.1900. He also exhibited two Dartmoor views at the Elands Gallery in Exeter in 1907. <br> <br> There are examples of his work in the Plymouth City Museum and Art Gallery. 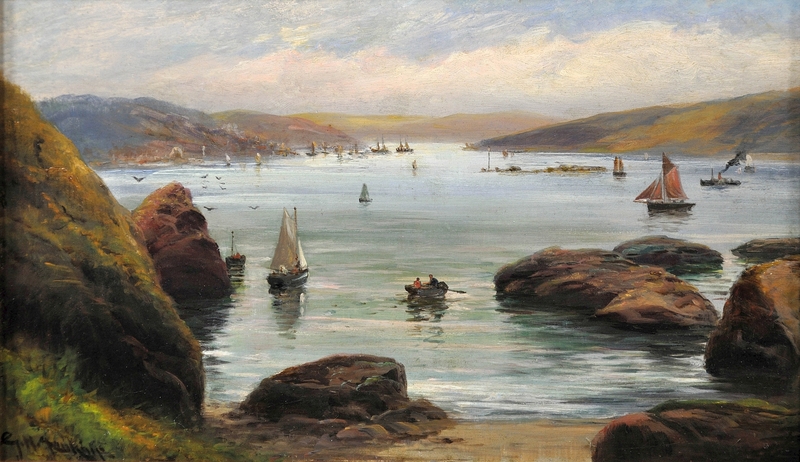 <br> <br> This original oil painting depicts a beautiful and serene scene, of Salcombe harbour on the south Devon coast, looking over Black Stone Rock. Each side of the harbour are rolling hills, in rich greens, purple hues and golden tones. The sea is tranquil and aquamarine in colour. In the foreground are large solid rocks, towering up from the sea and framing the piece, with a patch of clear sand in the foreground. It is a fine day and the harbour is busy with little sailing boats, a dozen or so of them with sails, white and red. There is also a paddle steamer vessel crossing the harbour, and a small rowing boat in the foreground, with a couple of figures in it.A few seagulls fly around the rocks to the left of the picture. There is a small bank in the middle of the harbour with a hazard marker on it, but there is no sign at all of any danger. The sky above is pale blue with light cloud, and the overall impression is of unhurried activity and quiet contentment. Available for sale from Big Sky Fine Art; this original oil painting by George Henry Jenkins, dating from around 1890. The painting is presented and supplied in a late 20th century complimentary frame. George Henry Jenkins was a West Country artist who painted extensively throughout Devon and Cornwall in both oil and watercolour. His subjects are landscapes and seascapes. He lived at 10 Saltram Terrace, Plympton, Plymouth from 1873 to 1880. He and his wife Hannah had seven children. His second child was named after him and also became an artist. He exhibited locally at the Society of Western Artists, Plymouth Arts Club and at the RWA in Bristol. He showed a total of 20 works at the RWA between 1892 and 1895 at the Annual Winter Exhibitions, subjects included On the Lledr, North Wales and in 1892 King Arthur's Castle, Tintagel. He did not appear to exhibit in London but did show Trawlers entering Plymouth Sound at the Dore Gallery in an exhibition of West country artists c.1900. He also exhibited two Dartmoor views at the Elands Gallery in Exeter in 1907. There are examples of his work in the Plymouth City Museum and Art Gallery. This original oil painting depicts a beautiful and serene scene, of Salcombe harbour on the south Devon coast, looking over Black Stone Rock. Each side of the harbour are rolling hills, in rich greens, purple hues and golden tones. The sea is tranquil and aquamarine in colour. In the foreground are large solid rocks, towering up from the sea and framing the piece, with a patch of clear sand in the foreground. It is a fine day and the harbour is busy with little sailing boats, a dozen or so of them with sails, white and red. There is also a paddle steamer vessel crossing the harbour, and a small rowing boat in the foreground, with a couple of figures in it.A few seagulls fly around the rocks to the left of the picture. There is a small bank in the middle of the harbour with a hazard marker on it, but there is no sign at all of any danger. The sky above is pale blue with light cloud, and the overall impression is of unhurried activity and quiet contentment.